My boys sort of tend to run hot and cold on hummus, no matter how much I’d really like them to enjoy it. I love the stuff, and it’s such an easy, nutritious thing to serve that it would surely be an excellent addition to their repertoires. But it’s not often I find they’re willing to indulge. That’s why it was so surprising to me when L. eagerly tried — and liked — these little tarts. Don’t get me wrong; these are not on his list of favorite lunches. But I’m including them in this roundup because there are so many kids out there who really DO enjoy hummus, and so many parents who’d like a meat-free, nut-free protein alternative for lunchboxes. A couple of these tarts would be a fun vegetarian option that would still offer plenty of flavor and plenty of protein. 1 roasted bell pepper, cut into 16 squares (about 1 inch) — or you can use 1/4 cup of a red bell pepper spread or relish, if you prefer. Preheat oven to 425 degrees. Lightly grease 16 muffin tins. On a floured surface, roll out the pizza dough to ¼ inch thickness. Cut the pizza dough into 16 circles, four inches in diameter. Press each circle into the bottom and sides of a prepared muffin cup, forming a shell. Fill each with some dried beans or pie weights to keep the dough from filling in the centers while baking. Bake the pizza dough tart shells at 425 degrees for 10 minutes, until golden brown. Allow them to cool and discard the beans. 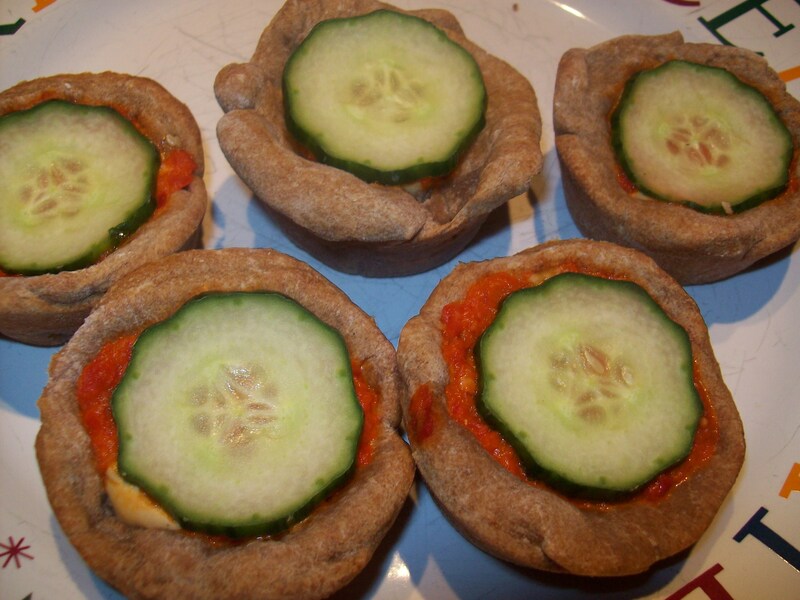 Fill each cooled tart shell with a few teaspoons of hummus and 1 slice of roasted pepper. Top each with a slice of cucumber.